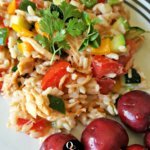 This week in my kitchen, I’m trying to be uberfrugal – both to save money and to be a good steward and not waste what we have. That means being creative and using what I have on hand. 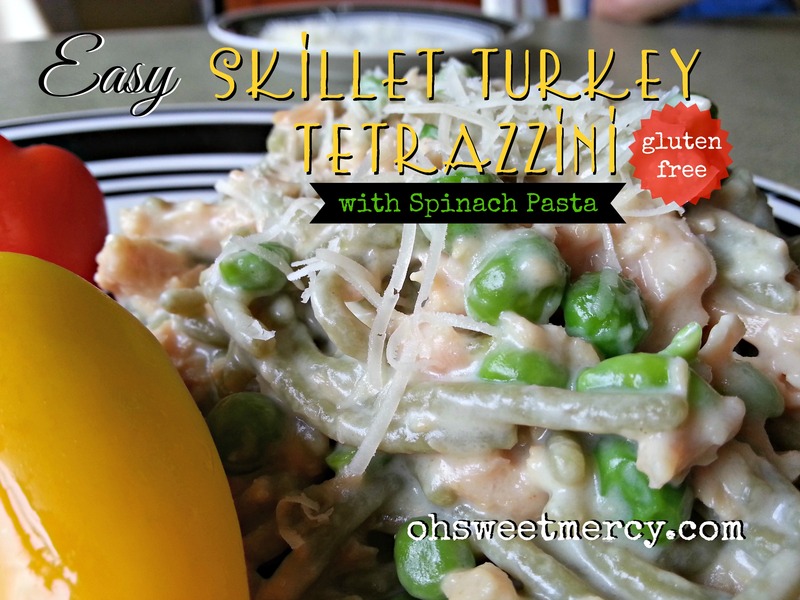 One dish I threw together is this Easy Skillet Turkey Tetrazzini. Tetrazzini appears to have many personalities, so it’s a perfect dish for frugal cooks. You basically take pasta, a cream sauce, a protein, and perhaps mushrooms and peas, mix it together, top with cheese and throw it in the oven. I didn’t feel like using the oven on this particularly hot day so I just made this on the stove top. Some recipes call for canned cream soups, and since I don’t use canned soups any more (have you tried my easy gluten-free Cream of Mushroom Soup?) and I didn’t have ingredients on hand to make my own, I had to come up with something else to make that creamy sauce. Broth, cream cheese, butter, mozzarella and romano cheeses and garlic fit the bill nicely. After Thanksgiving last year, I canned six or eight quarts of turkey with broth, and I was very glad to have canned meat on hand! 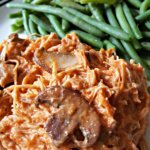 I used the broth in the jar to make the sauce for this Turkey Tetrazzini, but you can use chicken, turkey or whatever broth you have on hand. Keep in mind that each broth imparts its own flavor! To make this easy Turkey Tetrazzini, fill a large pot with water and place over high heat. When the water has come to a rolling boil, add the pasta and stir well to prevent sticking, reduce the heat but keep it boiling. Stir occasionally. Meanwhile, to make the sauce, start with a heavy-bottomed sauce pan over low heat and melt together the butter and cream cheese, whisking until smooth. Whisk in broth and garlic and simmer slowly, stirring frequently to make sure it doesn’t burn. The broth I used was very flavorful, so I didn’t need to add any other seasonings. Depending on how flavorful your broth is, you may want to add seasonings to boost the flavor, such as onion powder, an herb-seasoned salt (go light on the salt until after you add the cheese or it may end up too salty) or fresh or dried herbs such as thyme or marjoram. Once the sauce has simmered gently for a few minutes you can turn the heat down to low to keep it warm. When the pasta is about five minutes from being cooked, add 3/4-1 cup of fresh or frozen peas and cook until pasta is done. 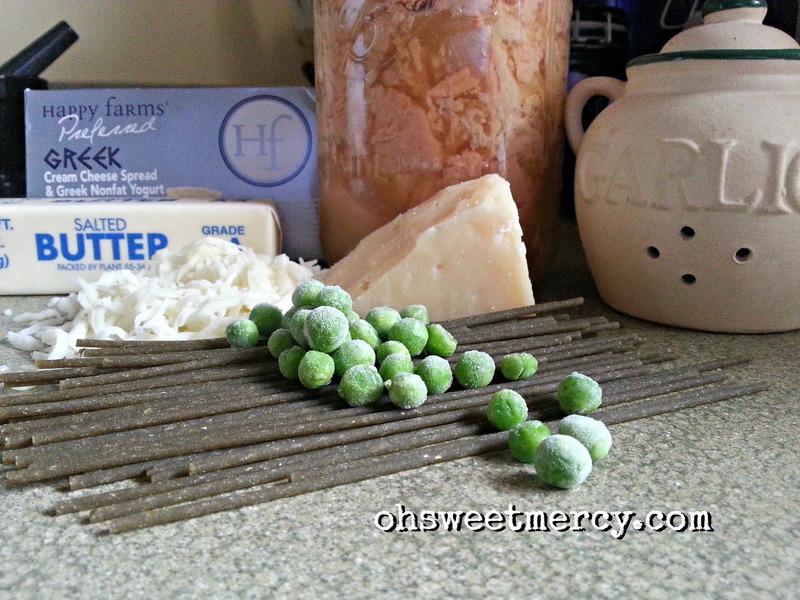 Drain the peas and pasta in a colander, then add turkey to the empty pot and warm it on the stove over medium heat. 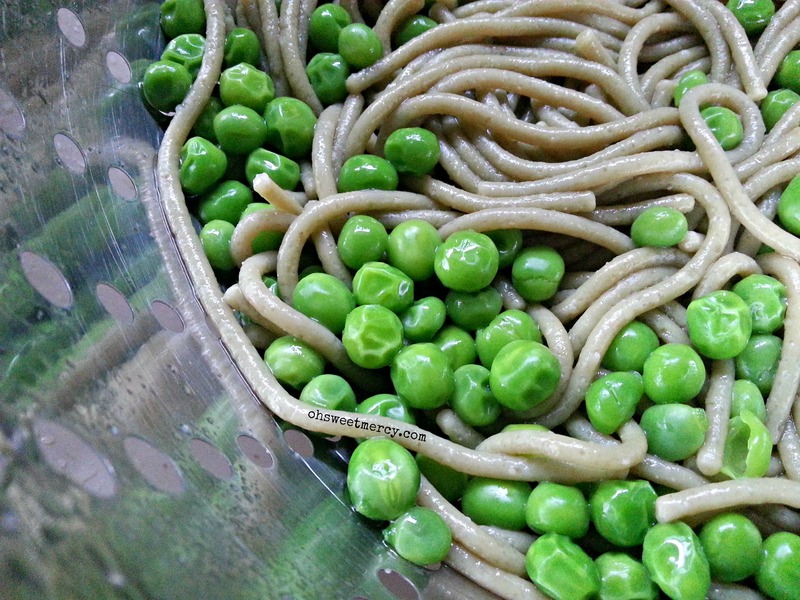 After a few minutes, mix the drained peas and pasta into the turkey in the pot. To the smooth, warm sauce add the shredded mozzarella and romano cheeses and stir well until the cheese melts. Taste the sauce and add salt and freshly ground pepper, if desired. Then pour the sauce over the turkey and pasta mixture, mixing well. If you find the sauce too thick, you can thin it down with a bit of milk or broth until it’s at your preferred consistency. 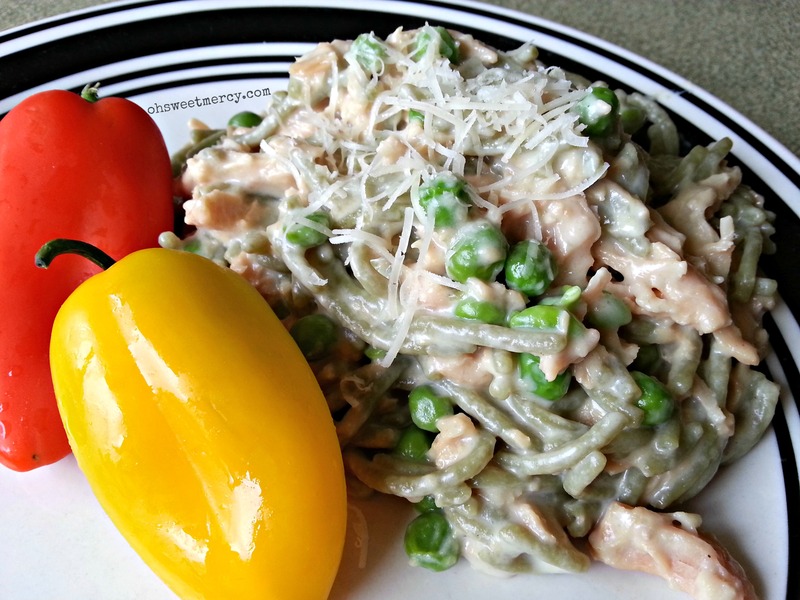 Serve this delicious Turkey Tetrazzini with more grated romano cheese on top and a side of fresh veggies or salad. If you don’t have a gluten issue, you can just use regular pasta. You can also bake this in the oven if you like. Simply place the mixture into a greased baking dish, top with your choice of shredded cheese and bake in a preheated 350 degree oven for 20-30 minutes or until hot and bubbly throughout and cheese is melted. An easy stove-top version of a baked classic using whole food ingredients. Depending on how flavorful your broth is, you may or may not want to add extra seasonings such as onion powder, an herb-seasoned salt, or fresh or dried herbs. Add salt after adding cheeses to prevent the sauce from becoming too salty. 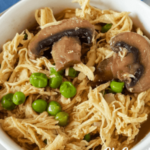 Don’t forget to pin this Easy Skillet Turkey Tetrazzini recipe to your favorite easy recipe board! This looks really yummy! Might have to make it this week!